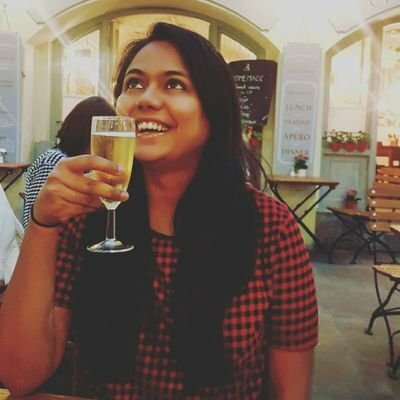 I'm Aditi Kaushiva, a freelance writer, blogger, travel junkie and foodie. I started blogging in 2013 as a way to escape the routines of life, and never did I imagine that this would lead me to a path of self discovery. 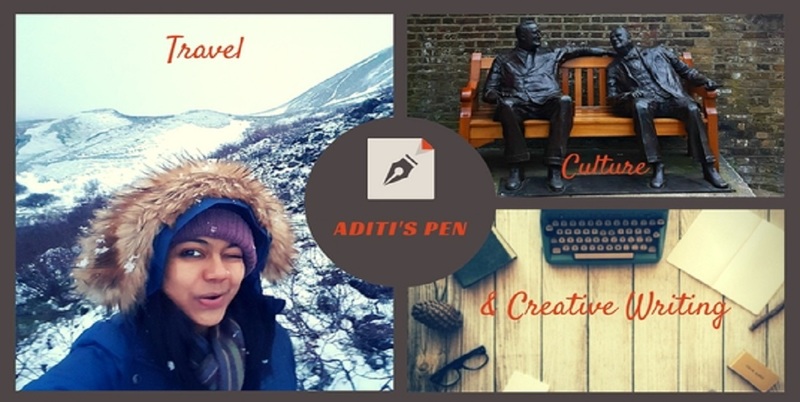 I started out by sharing snippets of personal life and thoughts, and gradually grew as a writer, finding my mojo in fiction and travel writing. In 2015, I made no new year resolutions, but chose 'Embrace' as my word of the year, which helped me become more focused towards my goals, and I found the courage to self publish my first Ebook, an anthology titled '26'. That year also saw us making the Big Move; shifting to another continent! As husband's job beckoned him to the vibrant city of London, I found myself looking at opportunities to start a career in writing full time. 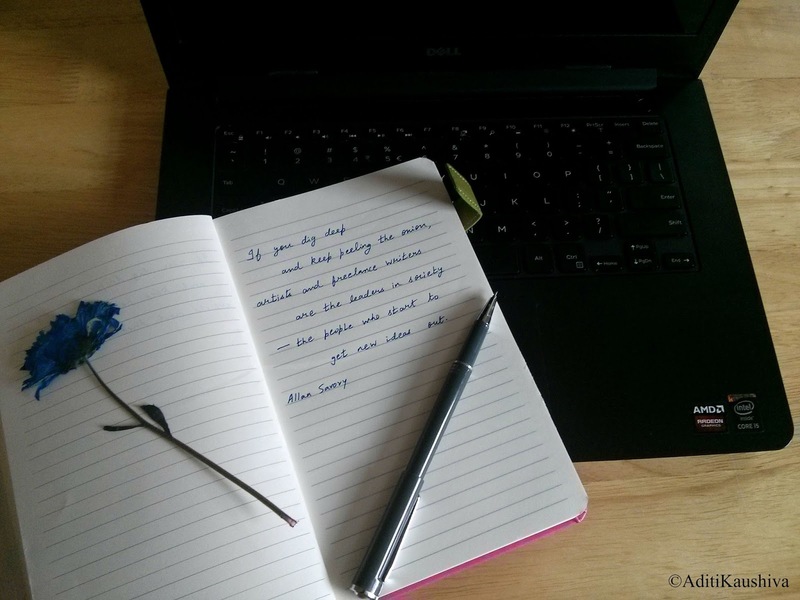 This year, I have decided to 'Create with Confidence' focusing more on writing. I am working on two books, one an anthology based on Indian mythology, and another a short story/novella currently titled 'A Woman's Portrait', both of which I hope to publish in 2018. Another one of my passions is Dancing. Although on and off, it has been an integral part of my life, and I have enjoyed my share of stage performances all through the school years, graduation and post graduation. I've had basic training in the Indian classical dance form, Bharatanatyam, as well as western styles, Jazz and Modern. I often dreamt of opening my own dance school and while the plan for the same is still brewing, I along with a friend, co - founded The Dance Bible in 2014, a first of its kind online portal for dance enthusiasts. A learning curve, this brush with creative entrepreneurship has helped me explore and develop skills such as social media marketing, SEO, content management and networking. In 2017, I took a big leap and also launched The Dance Bible Store - India's only Dance Inspired Lifestyle Store. I now work with a small team and among other things I love the joy of cultivating these young minds I work with. My brush with entrepreneurship has not only made me a learner, eager to pick up new tips and tricks of marketing my business, but has also helped find the teacher in me, as I pass on the knowledge, big or small, to my team. I enjoy the little things in life and believe in the power within each one of us to add more meaning and beauty to our lives. Here on my personal blog, I tell stories, stories that inspire and instill belief - stories from my travels, life, culture, and stories that sometimes, well, take you away from reality into the world of fiction. Now make yourself comfortable and tell me about yourself! Here, have some chocolate cake and coffee to loosen you up! You’ll sometimes find sponsored content here – always clearly disclosed, with any free samples I received clearly indicated. Links will sometimes be via affiliate sites, which means I receive a small amount of revenue per click. I work to maintain integrity and honesty in my posts, and only feature brands that align to my own values & beliefs. Well you are behind the dance bible?! cool. I just saw the website through some blogging platform and I though the idea is really cool. Good to meet someone behind the project. Good luck. Update : I dont know why your blog doesnt allow me to post through Wordpress account. Thank you so much! I need to keep pushing myself and publish the book this year. Thanks for the word of encouragement.